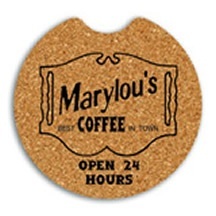 Our same high quality 100% natural cork coasters are now available in a 2-5/8" diameter with a notch on top for easy removal. These inexpensive and durable coaster protectors fit most cup holders in cars, trucks, boats and RV's to keep them clean. Advertise your message or logo and pass them out instead of business cards. An additional $40.00 non-refundable artwork layout charge (per imprint color and side) must be paid before work can begin.